Israeli strategists are hoping the Iranian elections are won by Israel's worst enemy - President Mahmoud Ahmadinejad. “His extremism and his calls for Israel’s destruction have pushed the international community to try to head off Iran’s nuclear program,” a senior official in Jerusalem said. A victory by the relatively moderate Mir Hossein Mousavi will not stop the program, he said, while it could lull the international community into thinking the threat is over. Palestinians because of what the Germans did to the Jews in the war. He has also called on Europe to provide the Jews with territory so that they could move their state to that continent. This extreme aggressiveness combined with his defiant flaunting of Iran’s nuclear program clearly marked him as Israel’s Enemy Number One. 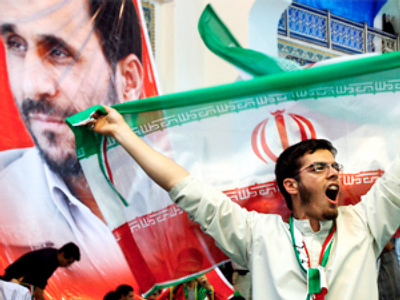 However, in the run-up to the Iranian election, Ahmadinejad’s re-election has come to be seen as a strategic advantage. “There is no one who has served Israel’s information program better than him,” columnist Ben Caspi wrote in the daily Ma’ariv. Israeli security officials note that decisions regarding major issues such as the nuclear program are made in Iran not by the president, regardless of who he is, but by Iran’s Supreme Leader, Ayatollah Ali Khamenei, and a small group of senior clerics. Amir, who monitors the Iranian media closely and is in telephone communication with Iranians, said that Khamenei might have ordered the Republican Guard to fix the election results to ensure an Ahmadinejad victory. “If these elections were truly free, Ahmadinejad wouldn’t get more than 15% of the vote, mostly from rural areas,” he said. Another reason that some Israelis are rooting for an Ahmadinejad victory, while holding their nose, is that the unprecedented level of passion revealed by the election campaign during the last few weeks, particularly among young voters, may be a signal that the long-awaited social explosion against clerical restrictions may be close, perhaps even imminent. The emotional engagement is seen as higher than that displayed in the 1997 elections, which brought reformer Mohammad Khatami to power. If Ahmadinejad is chosen for another four years, particularly if the victory is seen to be the result of ballot manipulation, the country could erupt. Officials in Israel have noted the warning issued by a senior figure in the Republican Guard this week, that it would confront any attempt at a “velvet revolution” by Mousavi supporters similar to the street demonstrations that brought down the Czech government in 1989. There is concern that a Mousavi victory would make it more likely that Washington would arrive at an agreement with Teheran, whereby Iran is permitted to build nuclear reactors for peaceful purposes, as President Obama had suggested in his Cairo speech this month. This would place Iran only a few months away from achieving a nuclear weapon if it decides to go for one at any point. supporting Hezbollah and Palestinian militants. Israelis have never understood the virulence with which Iranian leaders, and particularly Ahmadinejad, express themselves towards Israel. Iran has the largest community of Jews in the Muslim world and they are permitted to practise their religion freely. They are even represented in the Iranian parliament. A large number of former Iranian Jews live in Israel, among them two ex-chiefs of staff, a former commander of the Israeli air force and a former president. In contrast to the sophisticated assessments of Israeli strategists, the bulk of the public would doubtless feel reassured by a victory for the moderates.